There is not really a complex recipe for making floral or herbal vinegar. You will need to follow only a few steps to make sure you get the most out of your chosen flowers or herbs. For best results always pick flowers that are fully blossomed and not yet started to fade. You can use any edible flowers, that has a unique and strong perfume, such as nasturtium, marigold, or flowers of herbs such as garlic chive, chive. If you want to make an herbal vinegar, tarragon, dill, fresh bay leaf with garlic is a great choice. Making floral vinegar I always use either white vinegar or apple cider vinegar. Anything else would have very strong flavor for the flowers. Making herbal vinegar you can opt for white wine vinegar too. Clean the blossoms and shake off any bugs. Don’t wash the flowers because you will lose the fragrant pollens. 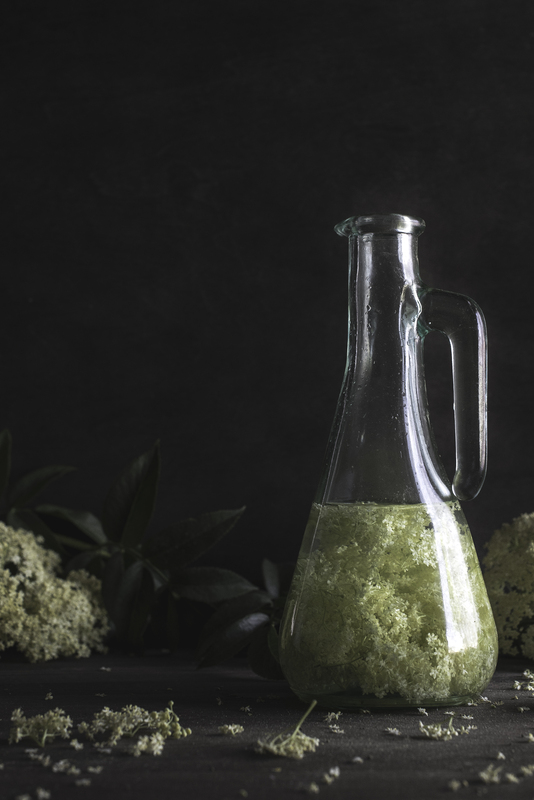 When making elderflower vinegar make sure you pick the flowers off of the bigger stalks and use only the flowers. 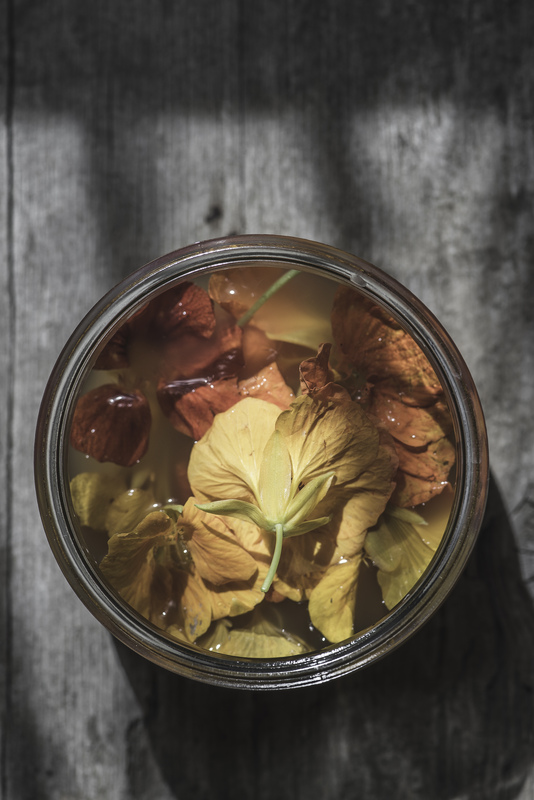 For the nasturtium vinegar, pick the flowers off the stem. Add flowers in the clean jar and fill up with vinegar. Close the jar tightly and let it sit at room temperature for 2 weeks, out of direct sunlight. Shake the jar every day. You will need to be patient and wait out this so that you get the most flavor out of the flowers. After this 2 week infusing period strain the vinegar, get rid of the flowers and decant the vinegar into a glass bottle, seal tight and store in the cupboard or fridge. Scotch egg was absolutely one of my favorites when we lived in England. I have been thinking about making a vegetarian version of it for a while now, and asparagus season seemed to be the best time for this experiment. Because we all know it. Asparagus, egg and breadcrumb go hand in hand in perfect harmony. For this recipe the most important thing I had to come up with is a vegetarian sausage meat replacement. I definitely prefer using vegetables over tofu, tempeh, seitan. I picked garbanzo beans because I knew that can hold other ingredients together very well. Later I will try to make it work with lentil, just simply because lentil is my favorite legume. I paired garbanzo with fresh fava beans, since they are in season too, and also wanted to add some of that cooked to the dish as well, to bring more brightness and freshness to the plate. So what are the components in the dish? I decided to serve the scotch egg with simply blanched asparagus. Scotch egg is traditionally deep fried and crispy, so it definitely needed a clean, fresh accompaniment, that is the reason for blanching, and not roasting or pan frying the asparagus. For a creamy sauce-y component I made a fresh, vibrant asparagus tarragon sauce. To prep asparagus cut off woody ends and carefully peel asparagus 2/3 up. (see picture above) Bring a big pot of water to the boil and season with salt generously. Blanching takes a few minutes, s no worries, the vegetables will not be salty. When the water is rapidly boiling, add asparagus and make sure boiling never stops! After a minute or two, depending one the freshness and thickness of your asparagus, transfer them into ice cold water. Now they are ready for any kind of dish to use. You can warm them up with butter/oil, pan roast them quickly or continue cooking for a few minutes in sauces. I blanched asparagus, freshly shucked English peas and fava beans. After blanching, I simply warmed them with some butter and seasoned with salt, black pepper and meyer lemon zest. Be careful if you have the urge to add lemon juice, it will quickly take away the fresh green color of your vegetables! To introduce my choice of herb, tarragon, to the dish I made a sauce using the asparagus scrapings that you can see in the top picture, as a base. Blanched the scrapings and tarragon is salted water, then dropped them into ice cold water to retain color. Separately sautéed white onion and let that cool and blended quickly with the blanched asparagus and tarragon. Seasoned with salt and ground black pepper. Right before plating added some meyer lemon juice to taste. See below detailed recipe for the scotch egg, included some tips for making them. It is really up to you what you serve these scotch eggs with . They are great cold, as part of a green salad, or warm with a simple asparagus soup. Scotch eggs may not be the quickest and easiest things to make but they are worth the work. Start with cooking the eggs. Boil water in a pot. Cook eggs in simmering water for 5 and 1/2 minutes, so the yolks stay runny. If you plan to eat some of the eggs later, I recommend cooking them longer, around 8-9 minutes. Cold eggs are just better when the yolk is not runny. Once the eggs are cooked, immediately put them in ice-cold water to stop them cooking. This is very important if you want to keep nice runny yolks. In the meantime start sweating the chopped onions on olive oil. Carefully cook them until translucent, not to burn them. Add the garlic, cook for a minute and finally the chopped mushrooms. Cook until you get rid of moisture. Let it cool. Rinse cooked garbanzo beans and transfer into a food processor. Add the onion mushroom mixture, the cooked fava beans, dijon, parsley and spices. Process until it forms a paste with chunky bits. A few tips : In case the mixture is dry, add a bit of olive oil. If you added too much oil at the beginning and feels too soft, add breadcrumb or even oatmeal. If for any reason your paste is not sticking together, add an egg and mix well. You will need to use this veggie mixture to coat the cooked eggs. Before coating the eggs with the veggie mixture, dredge the eggs in flour. This step will help the veggie mixture hang onto the egg’s surface. It is time now to coat the wobbly soft eggs in the veggie “mince”. The easiest way to do this: Place a portion of the mixture on a piece of clinging film. Cover it with another clinging film and with a rolling pin flatten it out evenly. Take off top clinging film and lift flattened disk, wrapping it carefully around the egg and molding into the right shape. It is a delicate task if you want runny yolks and your eggs are soft. I did break an egg, so take your time. Once the eggs covered in the garbanzo mix, let them cool in the fridge. If you want to make them in advance, this is the stage where you can keep them covered in the fridge for a day. To finish off the eggs, use the standard 3 step breading procedure to coat the egg: dredge in flour, moisten in the egg wash and coat in breadcrumbs. Fill a small pot with enough oil to cover whole eggs. Deep fry the eggs in batches if your pot is not too big, so that oil will not cool down while doing deep frying, to avoid soggy coating. Serve the eggs with your choice of accompaniment, such as salad, cooked vegetables, soup, sauce. Sorry for being away a bit long from my blog and not to be sharing new recipes with you. I have been very busy with moving and finishing my raw vegan studies at Matthew Kenney Culinary. But now I am back! Probably those of you following me on Instagram, saw that I found an urban gardening plot very close to our new home in Encino, California. It is called Sepulveda Garden Center. It is a spacious community garden with hundreds of plots of flowers & plants maintained by local residents. I had my friend @farmerkelley to visit the plot today and even she was soooo impressed!!! And that is a big thing because she does farming, gardening for a living!!! On the hottest day of this year, in 97F we just never wanted to stop exploring the gardens… And Kelley has her own garden, grows beautiful edible produce for chefs in Los Angeles. Still, again, she was impressed…. So back to my story about the pea tendrils…. Last week when I discovered the place, I saw people cutting out their pea full of tendrils and leaves!!! If you never tasted pea tendrils, you may not know what you are missing out…… Imagine eating crunchy lettuce that tastes the most delicate, sweet pea! (not the not edible sweet pea flower!!! but real, spring pea that is sweet. ) So insanely delicious, not to mention its beauty, how stunning it looks in salads and other dishes. So when I saw that some people are not aware of what they are throwing out, of course, I had to say hello 🙂 and suggest them not to do this next time:) 🙂 :)… So hopefully when they cut their peas back in the future, they will take the tendrils and blossoms home and eat them…. Until then with their permission I took some home. And of course I could never stop thinking, what to do with them, how to show you their beauty, and how to use them to highlight everything they have to offer. The only way to do it if the dish is all about them. Peas. Different textures, but same flavor. I also picked some stinging nettle (using a plastic bag;) during one of my walks. Stinging nettle is another spring messenger and has to be blanched to lose its stinging ability, and then it can be handled without gloves. This weed is true to its name for sure! Stinging! It is full of nutrients and really good to make tea, soups, sauces, oils. So I decided to make a vegan gnudi using blanched peas and stinging nettle. Gnudi traditionally is made with ricotta, so I made my own almond one to replace it. I didn’t want to cook the gnudi, and the almond ricotta, blanched peas and nettle had the perfect texture to hold. If you want you can also try adding some flax meal or almond flour to the mix. I knew that I will add the pea tendrils and blossoms with a touch of lemon juice, to bring more pea flavor and crunch to the soft gnudi. So now the only thing I needed some cream to bathe that gnudi in. I decided to use almond milk because I didn’t want a different nut profile to introduce. To make a flavorful crema, I braised some fennel and blended with almond milk and meyer lemon zest juice. The dish is fresh, vibrant, full of springy pea flavor with lemon essence and it is also an easy one to make. I really hope you will try either making this whole dish or at least just use it as a flavor or technique inspiration in your own translation! How to blanch peas and stinging nettle? Bring a very big pot of water to the boil. Add salt so the water so it tastes like sea. (it doesn’t mean your pea will be salty- because you blanch for a very short period, but the beautiful green color will be retained!) Prepare another big bowl with cold water and lots of ice cubes in it. Working in batches blanch your vegetables only for a minute, and add only as much vegetable to the boiling water so that you don’t lose boiling. It might be a bit tricky, but the result is very different! So once you blanched the peas/nettle, immediately transfer it into ice cold water, to stop cooking and retain color. Drain well and dry it on a paper towel. To make the gnudi add blanched peas, blanched stinging nettle and almond ricotta in a food processor. Process it to keep a good structure, see on my close shots of the gnudi. I left the gnudi tasting very fresh and spring, so didn’t add anything else to it. I decided to shape them into quenelles with the help of two small teaspoons. If you don’t want to do that, you can simply make small balls. But the two spoon way of making quennels is so easy, and it looks beautiful with this dish. To make the crema first I sautéed the sliced fennel on a tablespoon of olive oil. Added a little bit of water (you can add stock), covered and cooked on very low heat until soft. Once cooked, in a high speed blender I blended the fennel and almond milk. Start adding little milk and add more bit by bit to make sure the sauce is not getting too thin. Season the sauce with salt, black pepper, meyer lemon zest, meyer lemon juice, touch of cayenne and the optional ground nutmeg. To plate, place a swirl of the crema on a shallow plate, arrange gnudi quenelles or balls alongside the swirl and arrange the pea tendril and blossoms and the peas, if you add that too, so that they form a close unity. The idea was born yesterday. A series of seasonal market brunches on Sunday. And why? As much as I enjoy creating complex dishes and paint a beautiful plating with my food, just as much enjoy the simplicity, yet complexity if done well, of farmfresh food. I love coming home from the market, looking at all the beautiful produce I bought, and make something simple, yet flavorful, feeding our hunger on a weekend morning. As far as I remember weekend brunches have always been my favorite. Even before I named them brunch, back in Hungary. Waking up late, starting the day slow with a cup of coffee and feeling hungry only a bit later. So around midday we would have a big breakfast, which essentially is brunch. And now on weekends I usually go to the market and making brunch with the fresh produce just comes natural. 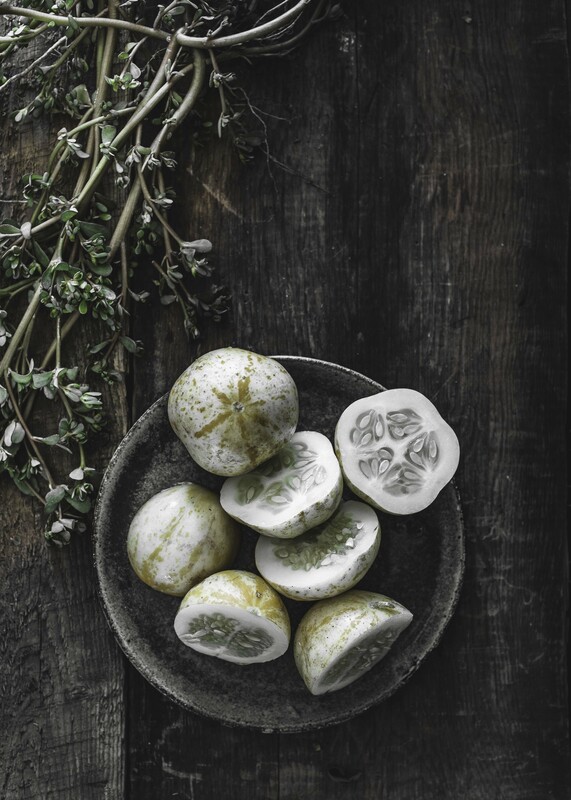 In this series emphasis will always be on some of the produce, enhancing their flavor with simple cooking techniques and the right seasoning, herbs. Hope you like it and join me on Sundays! Yesterday I went to my local market here in Pasadena. I like it because of the close proximity, the beautiful backdrop of the mountains, and also the perfect selection of farms. There are some definite favorite growers of mine, which I will introduce you next week, in case you live nearby you can try their produce. This is what I mostly I ended up bringing home:). I say mostly, because there are other things as well, that I buy every week, such as bread, egg, goat cheese and some veggies for juicing. I buy kiwis for my husband, he really loves them, and I bought all the parsnip, apple, carrots, radish for my final project in raw vegan cooking, that I am making this coming week. Looking at the produce I decided to make a beet salad with boiled eggs. When I saw how perfect looking the beet greens are, I knew I had to keep them. I tasted it, it was flavorful, but the bigger leaves were a little bit hard. So I decided to remove the leaves of the stalk, cut the big ones into baby spinach leaf size, and keep the small ones in whole. I made a deliciously flavorful vinagirette with that beautiful meyer lemon, after caramelizing it, and massaged the dressing very well into the leaves and let it marinate for 15 minutes. Just like with kale it helps to start braking down the leaves, softens them for you to be easier to digest. I simply roasted the beets with rosemary in the oven, and pan roasted the radishes, adding celery salt to them. If you are vegan and you leave out the eggs, you can add fresh plant based cheese, or just simply nuts to the salad to make it a full, satisfying meal. Remove stalks, clean and dry beets. 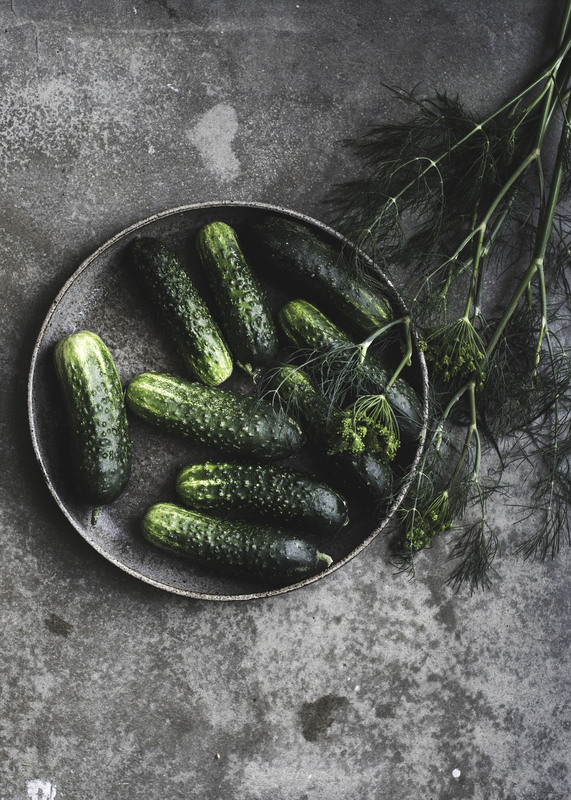 Place them in a roasting pan, drizzle with olive oil, add salt and rosemary sprigs. Cover with foil and bake at 430F until fork tender, don’t overcook. Cooking time will depend on the freshness, size of the beets. While the beets are roasting prepare the leaves. (see below) Once beets are roasted, put some gloves on and now you can easily peel them. Finally cut them into bite sized cubes. Drizzle with some extra olive oil, salt, a little bit of the vinaigrette and set aside. If you haven’t tried roasted radish, it is time now! Their texture and taste changes so much when heat is introduced, they just simply turn into a different vegetable. It is better to roast them on the stove, in a pan, because they don’t require much time, and you need high temperature. Heat the pan very hot, add high heat oil (olive, grape seed) and add the radishes in whole. Season with celery salt and black pepper. Roast until you have a nice color on the radishes and they have softened. Cut the big ones in half lengthwise for plating. First get the zest of the the meyer lemon. Then cut it in half and place in the roasting pan with the radishes, cut side facing down in the pan. Leave them there, not moving until they are caramellized. Squeeze juice out of them and get rid of pits. For the vinaigrette measure the juice and mix it with 3 times as much grapeseed oil. Add minced garlic, maple syrup, salt, black pepper and cayenne pepper. Mix ingredients very well, just before adding to the leaves and beets. As I said earlier, wash them first, then remove leaves from stalk, get rid of any not healthy, wiltied bits. Chop the fresh ones into baby spinach size. You can also add spinach leaves to the salad, but treat them separately. Spinach will not need time to soak the vinaigrette. Chop the scallions and mix with all the leaves. Then add vinaigrette to leaves, massage them well, and let it sit for 15 minutes. During that time you can cook the eggs and prep the roasted beets. Place eggs in boiling water, reduce heat to low and cook for 12 minutes. Immediately transfer eggs in ice cold water, to help them cool and stop cooking. Plate beet or spinach leaves in a bowl, add chopped scallions, layer with the roasted beets and radishes, top with the eggs and finish off with arugula blossom and your choice of nuts. Of course you can leave out the arugula blossoms, I had some at home and I used them for a bit of spice in the salad. You can mix arugula leaves to the beet greens, too. Hope you enjoy the freshness of this salad and your body will definitely will thank you for all the nutrient dense produce!